We offer walking tours and excursions in and around Cartagena, our guides speak English and Spanish. The guides are motivated by their passion for Cartagena and its historical and cultural treasures, besides the legends narrated that give a unique touch to our tours. We cover the main sights of the walled City. Our goal is to make the visitor spend a good time, which is why we tailor each tour according to the group. Our local guides with their vast experience and versatility to transport you full of charming colonial Cartagena. 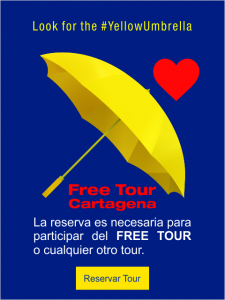 Walking tours of the most representative sites of Cartagena. The burgeoning neighborhood of Getsemani, just outside the fabled walls of Cartagena’s historic Old City shares the Spanish colonial architecture and stories of the independence and slave trade with the Old Walled City of Cartagena so we recommend to do both tours with us. At the end of the tour you can reward the work of the guide with a voluntary tip for the service and attention that you received during this tour. Booking is necessary to participate in the FREE TOUR or any other tour. You can to differentiate between tours with colour of events in the schedule.